Go to www.turnitin.comand click on the "Log In" button located at the top right corner & enter your username & password. Click on the “Enroll in a Class” tab to the upper left of the screen. 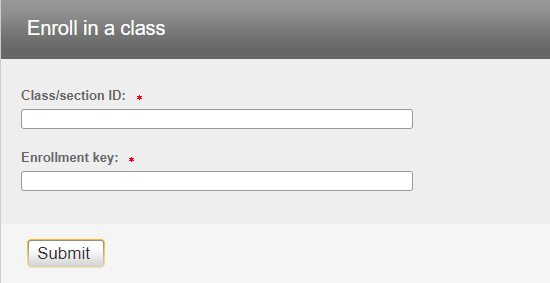 Type the class ID and the enrollment Key that your instructor has given you (don't copy and paste them) & then click "Submit". You will find your class on your homepage. Click on the class name and you will see the assignments for that class. If you need to enroll in another Turnitin classes, you will need the class ID and class enrollment key for each class from your instructor, and repeat the steps above.